Water: industry is misusing it, but for how long? Currently, industry guzzles about 22 per cent of the total freshwater used worldwide. By 2025, this figure is expected to go up to 24 per cent, says the World Bank's World Water Development Report 2001. In India, of all the categories of water use, industrial water use is rising the fastest. According to the Central Pollution Control Board (CPCB), water consumption by industry accounts for about 8 per cent of the total national use. By 2050, industry will need almost four times the water it uses now. But will it get this water? Highly unlikely. Water is already a source of conflict between communities and industry. In December 2002, the Coca-Cola plant in the drought-prone Perumatty village in Kerala's Palakkad district, faced serious opposition from the local community and politicians for depleting and polluting drinking water resources. The growing scarcity of water is also taking its toll on economic development. A recent study (Investment Climate in India, 2003) by the Confederation of Indian Industry and the World Bank has found that scarcity of water in Tamil Nadu is proving to be a major infrastructural bottleneck and a hurdle for investments in the state. With more clamour for the resource every year, the future presents a grim picture. The challenge for Indian industry is, therefore, to stay a step ahead of the crisis by becoming water-efficient. Industry's use of water acts as a double-edged sword: it puts immense pressure on local water resources, and it devastates the environment through wastewater discharge. Essentially used as input, mass and heat transfer media and for other miscellaneous purposes, a very small fraction of the water is actually consumed. 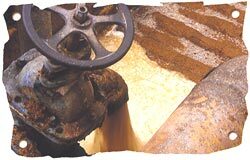 About 90 per cent of the water used in major water-consuming industries is ultimately discharged as wastewater. According to the CPCB, in 2001, Indian industry consumed 40 km 3 of water and discharged 30.31 km 3 of wastewater. The issue of water use in industries, therefore, has to be addressed within these two interlinked paradigms. Industry does not only use up a lot of water, it does so in an extremely inefficient manner. Compared to globally acceptable standards, the water consumption efficiency (water consumed to produce a unit product) of Indian industry is dismal (see table below: Guzzlers Inc). Thermal power plants (TPPs) are the major consumers, accounting for a staggering 88 per cent of the total water consumed by industry (see table below: Water use). In a scenario where the availability of water is dipping alarmingly, this is a recipe for disaster. Note: *Estimates based on wastewater discharge, assuming wastewater volume is 90 per cent of the water used in the industry. One of the main reasons Indian industry wastes water wilfully is because it costs almost nothing to do so. Companies pay a ridiculous 10 paise for 1,000 litres of water; in contrast, people in some cities end up paying between Rs 10-50 for the same quantity. Recently, the government amended the Water (Prevention and Control of Pollution) Cess Act, 1977 and introduced a revised water cess for industry. T R Baalu, Union minister of environment and forests, while presenting the bill in parliament, proclaimed that the new cess would augment the resources of Central and state pollution control boards, promote economy in the use of water, and stop its pollution by industries. The new rates, explained the minister, are about three times higher than the existing rates. But a close scrutiny of the new cess exposes the sham underneath. It shows that the amendment to the act will do nothing more than generate resources for pollution control boards. The revised cost of water is still so low that it is imbecilic to expect industry to be pushed by it to improve its water-use efficiency. For instance, the consumption of water in industrial cooling is three times its consumption in processing. But the new bill has pegged the cost of water for industrial cooling, spraying in mine pits or boiler feeds at a mere 10 paise/kilolitre (kl) -- two-three times less than the cost for process water (see table below: Cheap!). At this rate, the cooling water cess of TPPs, for instance, will constitute just 0.20 per cent of their total power generation costs (see table below: For instance: 0.265 per cent). The act's introduction of such low costs for cooling water has swept away hopes of any water conservation efforts for three-fourth of the water consumed by Indian industry. Costs fixed for process water are as illogical. Companies in Gujarat and Tamil Nadu are already paying third parties Rs 10-25/kl for process water; an increase of a mere 20-30 paise will not make any difference. To successfully confront the challenge of water, Indian industry will have to aim at zero freshwater demand and zero effluent discharge. So far, water management in Indian industry has revolved around two basic aspects: raw water treatment to meet end-use requirements and effluent treatment for meeting discharge standards. Isolated, but noteworthy, examples of innovation do exist: the Chennai Petroleum Company Limited, for instance, treats municipal sewage to meet its process water requirements and is on its way to close its water cycle as well. Of money spent on power is the cost of water!  RAINWATER HARVESTING: Collecting water within the plant's rainwater endowment; for low water-consuming industries, it could meet their entire requirements.